The earliest crystallographic activity at the Department of Physics of the Faculty of Science, University of Zagreb, begun with the PhD work of Katarina Kranjc (1915- †1989), Investigation of poly-dispersive systems with the aid of small-angle X-ray diffraction in 1954. Her supervisor was Professor Mladen Paić (1905-†1997), Head of the Department of Physics, who initiated crystallography at the Department. He was familiar with the Debye-Scherrer technique, which he used for experimental work in his PhD thesis performed at the University of Sorbonne in Paris in years 1930-1932. In 1946 he was appointed Head of the Department of Physics (1946-1970) and since then stimulated crystallography research. At the beginning only a Unicam-25 camera was at disposal. Until her retirement as full professor in 1985, K. Kranjc continued to use SAX in the research, but also Berg-Barrett X-ray diffraction microscopy to investigate the domain structure (Quantitative investigation of domain structures by Berg-Barrett X-ray Diffraction Microscopy, J.Appl.Cryst. 1 (1968) 227) and Moiré fringes in electron micrographs. She was a friend with Rosalind Franklin who visited Zagreb in 1953 and gave a lecture on X-ray diffraction. In 1954 K. Kranjc worked in Paris in the laboratory of André Guinier at the Faculté des Sciences, Orsay, and in 1958 spent a six month long post doc at the Department of Crystallography, Birkbeck College, University of London (in the Alan Mackay group). Antun Bonefačić (1925- ) joined the Department in 1960 and received his PhD in 1963 (X-ray structural analysis of some Ag-II sulfates). Again, M. Paić was the supervisor. A two-years long post doc (1964 and 1965) A. Bonefačić performed in the laboratory of Andre Guinier. There he worked on diffuse scattering produced by thermal lattice vibrations (X-Ray Study of Difusse Streak Diffraction Pattern from Silicon Single Crystals, Acta Cryst. 14 (1969) 589). In 1966 he became the Head of the research group Physics of Metals, and full prosessor in 1975. In 1971 A. Bonefačić received the Croatian National Science Award for Physics for his scientific research on crystallographic properties of metastable alloys. Numerous young researches joined Bonefačić in 1966 (Dragan Kunstelj, Mirko Stubičar, Anđelka Tonejc and Antun Tonejc). In 1967 Bonefačić and his assistants initiated structural research in the area of metastable metallic alloys obtained by rapid quenching from the melt using X-ray powder diffraction and electron microscopy. The instruments were Siemens X-ray diffraction unit (purchased in 1966) and Philips 120 kV transmission electron microscope EM300 (purchased in 1970). Anđelka Tonejc made her post doc also in the Lab of André Guinier at the Faculté des Sciences, Orsay, from 1974 to 1976. There she worked on rapidly quenched alloys using X-ray powder diffraction and TEM. 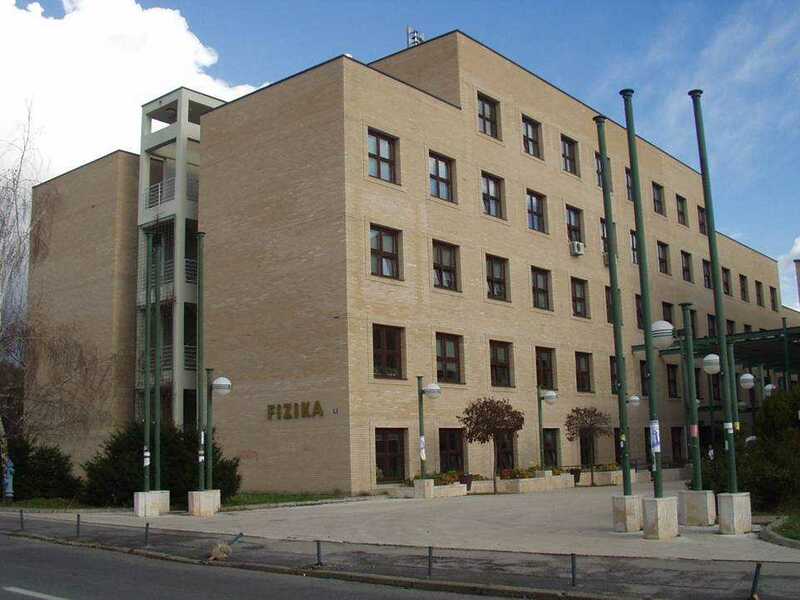 In 1991 Department of Physics moved into the new building and Antun Tonejc established the Laboratory for Microstructural Investigation of Materials with two new purchased instruments, Philips X-ray powder diffractometer and JEOL 200kV high-resolution transmission electron microscope. After the retirement of Professor Bonefačić in 1995, Antun Tonejc became the Head of the Laboratory. Stanko Popović joined the Laboratory in 1987 as full professor (on leave from Rudjer Bošković Institute; he retired in 2008), and later also young assistants Davorin Bagović (from 1992 to1995), Igor Đerđ (from 1998 to 2008, now at the Ruđer Bošković Institute), Željko Skoko (in 2000), and Ivana Lončarek (in 2006). Anđelka Tonejc has focused her research on high-resolution electron microscopy investigation ( HRTEM: image processing analysis of defects and grain boundaries in nanocrystalline materials, Acta Chim.Sloven. 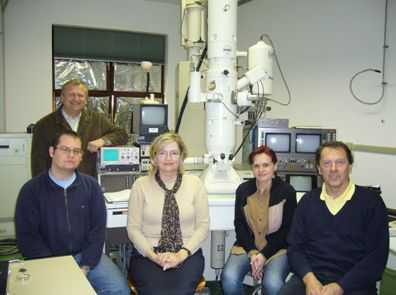 46 (1999) 435) and, with Igor Đerđ, was one of the first researchers who used the Rietveld method for electron diffraction analysis (Structural investigations of nanocrystalline TiO2 samples, J.Alloys Comp. 413 (2006) 159). In 1990 Antun Tonejc initiated structural examination of mechanically alloyed materials using high-energy ball milling (Crystallographic features of mechanically milled and alloyed nanosized and amorphous materials, Acta Chim.Slov. 49 (2002) 1), and received the Science Award of Croatian Academy of Sciences and Arts in 2008 for structural investigations of phases and phase transitions in nanostructural materials prepared by extreme techniques. Stanko Popović has mainly focused on X-ray diffraction line profile analysis (Reliability of the simplified integral-breadth methods in diffraction line-broadening analysis, J.Appl.Cryst. 29 (1996) 16), on microstructural investigations of Al-Zn and Al-Ag-Zn alloys ( Phys.Stat.Sol. A140 (1993) 341; Croat.Chem.Acta 82 (2009) 405; Z. Krist. 30 Suppl (2009)309), and on mixed metal oxides in collaboration with the Department of Materials Chemistry, Rudjer Bošković Institute. He received Croatian National Science Award for Physics for X-ray diffraction line profile and quantitative phase analyses (2001), and became Fellow of Croatian Academy of Sciences and Arts (2004). solid state physics and crystallography.